St. Patrick’s Day will be celebrated at the Pembroke Library on Wednesday, March 14th, 6:30 PM, with a free concert celebrating the 50th Anniversary of one of the most important sea music recordings of all time; “The Clancy Brothers & Tommy Makem – Sing of the Sea.” The Clancys and Makem were the key figures in the Irish music revival that continues to today. Their 1968 album “Sing of the Sea” brought many Irish music enthusiasts throughout Europe, North America and Australia to embrace the traditional music of the Age of Sail. Inspired as long-time participants in this tradition, the members of “From Away Downeast” will perform the songs included on Sing of the Sea, including work chanteys, romantic adventure ballads, songs of humor, and laments for those lost at sea. 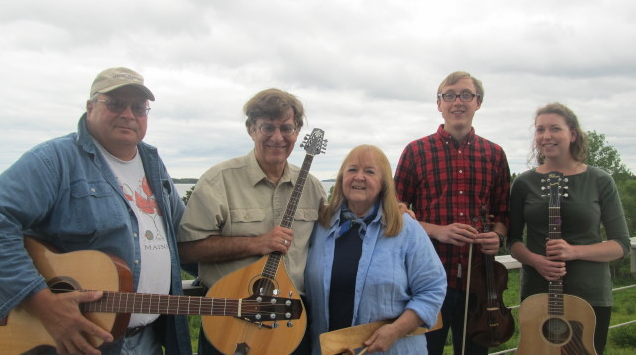 With singing accompanied by fiddle, banjo, harmonica and guitar, and encouragement for the audience to sing along, the concert is the perfect opportunity for enjoying traditional Irish music in a friendly, community atmosphere, taking part and pride in Downeast Maine’s own maritime heritage. The Wednesday, March 14th sing-along concert starts at 6:30 PM. Admission is Free, with free refreshments afterwards. The Pembroke Library, which full handicap access, is located at 221 Old County Road, across from the Pembroke fairgrounds and horse track. For information, phone 726-4747 or 726-4745, or email .